Holdyn Keefer, sporting a Batman mask, celebrating his end of chemotherapy treatment. Holdyn Keefer pictured with his family members Travis, Sarah, Dylan, and Landyn. POINT PLEASANT — A community wide celebration will take place today for one of its biggest little heroes. Holdyn Keefer has battled and conquered an aggressive type of leukemia. He rang the bell to finish his chemotherapy treatment this past Monday. To celebrate, a community party from Holdyn and his family will be held today (Saturday) from 11 a.m.-2 p.m. at the First Church of God in Point Pleasant. Travis Keefer, Holdyn’s father, shared his family is holding this event so the community who has supported them through this journey can celebrate this big victory with them. “Sarah (Holdyn’s mother) and I wanted it to be a way to say thank you to our community who has supported us through every step of this journey. We are so blessed to live in the community that we live in,” said Travis. He shared Amy Nelson aided with the planning of this event and Holdyn also had a lot of input in the planning and he wanted it to be fun and have a lot of food. The event will have a bounce house obstacle course set up outside of the church, rented by New Hope Bible Baptist Church, along with corn hole said Travis. He added face painting will be done by Deana Spaulding of Andrea’s Angels — Please Don’t Drink and Drive. Along with the fun activities, there will also be a bountiful amount of food such as pizza, hot dogs, smoked pulled pork, and more. Travis commented all of the food was donated by businesses in the community. As a special guest, West Virginia Batman from Heroes 4 Higher will be stopping by from noon-1 p.m.
“He (W.Va. Batman) has played a big part in Holdyn’s journey. It is only fitting for him to celebrate with us,” said Travis. Holdyn was diagnosed with Pre B Acute Lymphoblastic Leukemia (ALL) Philadelphia Chromosome positive on Jan. 11, 2016 with his chemo treatment starting two days later explained Travis. He was just a month shy from turning five years old. Travis shared during Holdyn’s first year of treatment he was spending a week in the hospital every other week, then the next six months were a week each month in the hospital to receive chemo. During the last year, Holdyn was doing out patient chemo at Edward Comprehensive Cancer Center said Travis. Holdyn had to take it a lot easier in his everyday life compared to other children his age. “Due to his leukemia being a more aggressive type, he had to have more aggressive chemo. Especially in the first year, he didn’t feel like doing hardly anything. When he did have a ‘good’ day, he usually did too much and would barely get out of bed for the next couple days,” said Travis. This journey has been no easy feat for Holdyn or his family. “It was hard on the whole family because Holdyn had to spend so much time in the hospital and we were all separated. 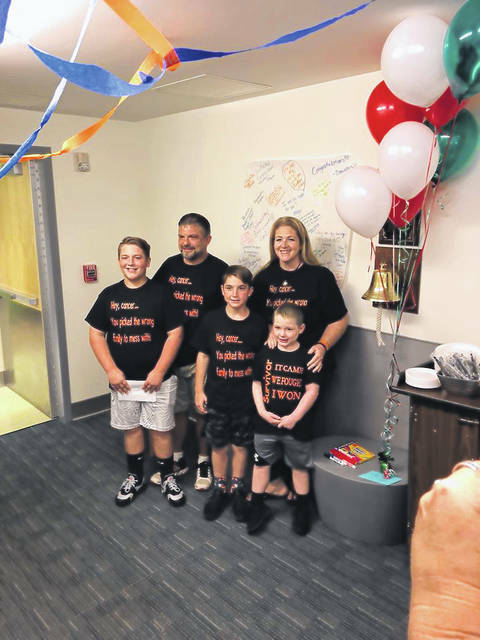 A lot of the time the older brothers (Dylan and Landyn) stayed with their grandparents so Sarah could stay in the hospital with Holdyn and I had to work,” said Travis. He commented he and his family are “elated” by Holdyn finishing his treatment. “We are ready to put this chapter in our life behind us. Holdyn feels the same way, he’s ready to be a normal kid again,” said Travis. He added all of the businesses who donated to this event will be posted on the Team Holdyn Facebook page. Travis encourages everyone to support these businesses when they are out and about in the community. 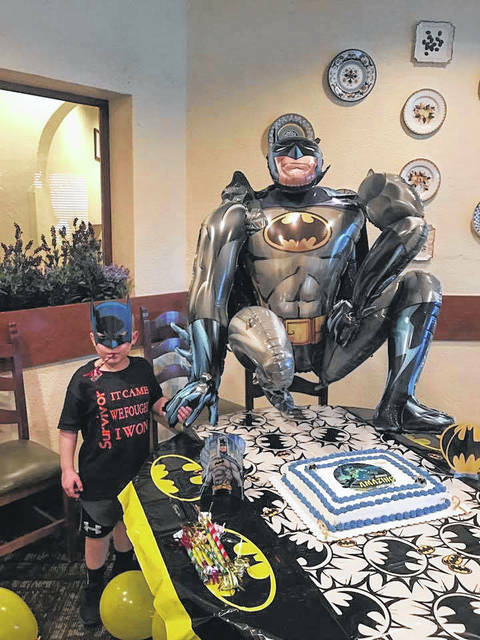 https://www.mydailyregister.com/wp-content/uploads/sites/24/2018/09/web1_0922.HF1_.jpgHoldyn Keefer, sporting a Batman mask, celebrating his end of chemotherapy treatment. https://www.mydailyregister.com/wp-content/uploads/sites/24/2018/09/web1_0922.HF2_.jpgHoldyn Keefer pictured with his family members Travis, Sarah, Dylan, and Landyn.